It would be hard to overstate how important Diana H. King was to the field of dyslexia education. As a passionate advocate for children with dyslexia and committed educator of teachers, Diana made an impact that will continue for generations. Diana wasn't just a hero for those in dyslexia education: she was a beloved friend and mentor to many, including our co-founders Susie and Steve. An unfailing supporter of Camp Spring Creek, Diana had a tireless dedication to children with dyslexia, a quality we strive to emulate here at camp. Below is a rememberance of Diana written by her long-time friend and colleague, William Van Cleave. Diana Hanbury King (1927-2018), pioneer and legend in the field of dyslexia, passed away at her home on June 15 after a short illness. Under the aegis of mentor Helene Durbrow, Diana began her nearly seventy-year career in the field of dyslexia at Sidwell Friends School in Washington, D.C., where Anna Gillingham visited regularly to supervise teachers. Prior to that, she had spent time in Southern Rhodesia (now Zimbabwe) on her uncle’s farm, Kildonan; both her uncle and his daughters had what she later realized was dyslexia. Her first teaching job--at Ruzawi--came about by pure chance while she lived there, and thus began a lifelong passion. In 1955 Diana established Dunnabeck, a summer camp in Pennsylvania, designed to meet the needs of dyslexic students. She served as the camp’s director for 35 summers. 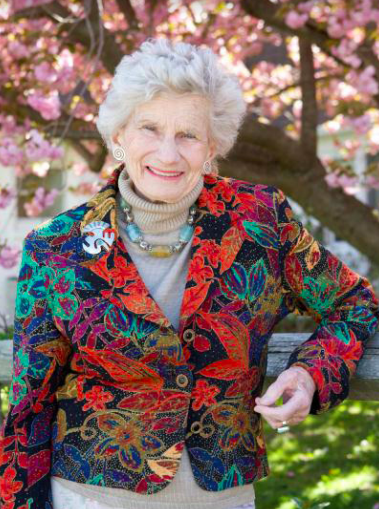 In 1969, with the help of Kurt Goldman, she established The Kildonan School, first in Bucks County, Pennsylvania, then in Amenia, New York. Both programs continue to flourish. Schools, camps,and training programs around the world, including Fraser Academy (Canada) and Camp Spring Creek (North Carolina), have been established with her vision and guidance. Durango Mountain Camp was also inspired by Camp Dunnabeck, and The Diana Hanbury King Academy for training teachers opened recently in Australia. Diana mentored dozens of leaders in the field of learning difficulties--authors, school administrators, dyslexia rights advocates, and international presenters who acknowledge her as a driving force behind their work. She authored some fifteen important teaching books and continued to write up until a few weeks before her death. A gifted presenter, Diana trained thousands of teachers in both public and independent schools. Never one to suffer fools gladly, she expected only the best of teachers--because, as she often said, our students “do not have any time to waste.” It was rare to win an argument with Diana. You needed to come prepared, and sometimes with research done, usually to find that she was correct in her initial position. Even so, she gave of herself selflessly to her students and her trainees, never unwilling to share her time and advice, her suggestions, and her passion for teaching. A Founding Fellow of the Academy of Orton-Gillingham Practitioners & Educators and a member of the International Dyslexia Association (formerly known as the Orton Dyslexia Society) since 1951, Diana received the New York Branch Annual Award (1985), the Samuel T. Orton Award (1990), and the Margaret Byrd Rawson Lifetime Achievement Award (2013) for her work on the national level. In 2016, she received the National Teachers Hall of Fame Lifetime Achievement Award, only the second time in 25 years that they have bestowed this honor. When asked, Diana was always quite clear that her first passion and best skill was tutoring students with dyslexia. At her passing, a former student wrote, “Mrs. King was the best teacher I ever had. She was always hard but gentle with me because she knew the potential of her students.” She was a gifted instructor who understood deeply the notion of diagnostic-prescriptive teaching and used her almost limitless knowledge to inform her instruction in each session with her students, who ranged in age from five to adult. She taught at schools and camps, in public and private school settings, and even for a time at a prison. Diana was born in England and was a naturalized American citizen. She held a B.A. Honors degree from the University of London, an M.A. from George Washington University, and an honorary doctorate from New England College. She knew to some degree five languages, including French, German, Italian, Spanish, and Russian. She was a passionate gardener, a vodka drinker, a world traveler, and a lover of words and their origins. She read extensively across a wide variety of disciplines. She was an avid horseback rider and downhill skied well into her sixties. By the age of 80, she had two tattoos, including a full color dragon, which adorned her shoulder. Diana was devoted to her extensive family as well. She is survived by her son, Christopher King; grandchildren Ian Michaels, Sol Michaels, and Eliana Ballen; sisters Jillian Poole, Anna Larkin, and Josephine Coatsworth; ex-husband and lifelong friend James Cecil King; nephews Tony Poole (Elizabeth) and Colin Poole (Kristine); two grandnieces, Natalie and Alison; and first cousin, Ashley Hanbury, in South Africa. She was predeceased by her parents, Una and Anthony Hanbury; her daughter, Sheila King; and her son-in-law, Murray Michaels. A lifelong teacher and learner and a force to be reckoned with, Diana leaves behind an enormous legacy in the programs she built, the teachers she inspired, and the students she taught. Those who work in the field of dyslexia have benefited from her wealth of knowledge and her passion for teaching. Her legacy lives on through them. In lieu of flowers, Diana’s family asks that donations be made to The Kildonan School Pool Fund (kildonan.org), the International Dyslexia Association (dyslexiaida.org), or the Academy of Orton- Gillingham Practitioners & Educators (ortonacademy.org).